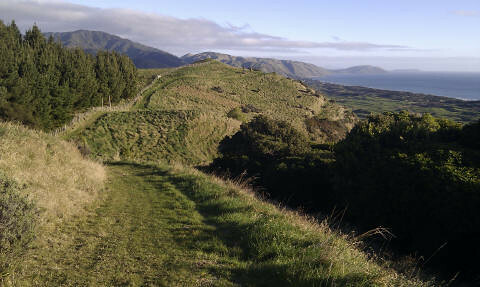 This walkway provides excellent views over Raumati and Paraparaumu, the coastline and across to Kapiti Island. Tree planting and track upgrades are underway, with seats and picnic table at June Rowland lookout. From end-to-end it is about 4 km so allow about 1.5 hours to walk the length one way. There is a carpark at the southern end on Waterfall Road about 750 metres from SH1, with a sign for Mataihuka Walkway (Raumati Escarpment). The path at this end is gravel and with newly planted trees on both sides. About 10 minutes from the start is the June Rowland lookout with seats and picnic table. 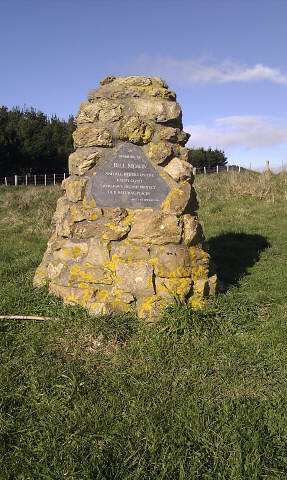 The track then climbs higher and becomes a grass 4WD track along the top of the hills leading to the Bill Moxon stone cairn about 30 minutes further on. The track is unfortunately now closed at the Panorama Dve end, so you have to go back to where you started. Parking is best at the Waterfall Road carpark, turn off SH1 at Queen Elizabeth Park/ Whareroa Farm exit & turn left up Emerald Glen Rd to the end, turn right- the start of the track is just up Waterfall Rd on your left. The area is exposed and there is no shelter along the length. Great on a summers day but be prepared with raincoat and warm clothing in case you do get caught out.